Some kids and their parents had their portraits. 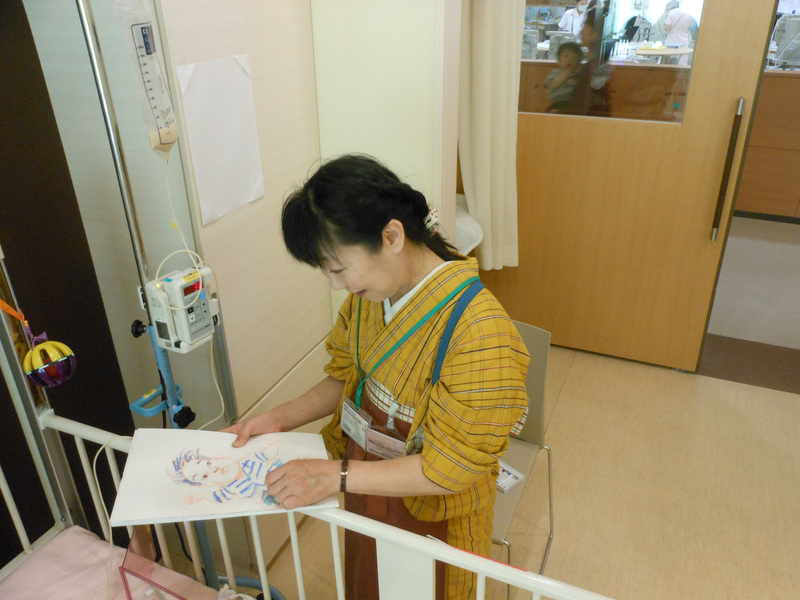 As other families had already had theirs by Pulin-san, new comers had been really looking forward to her visit. As the portrait was being done, crying kids were getting to stop crying. Some were looking into the pictures wondering how their faces were going to be. The finished ones were put on the wall by their bed so that they could see them anytime, even others in the same room. This occurs communication between families and make the rooms and even the ward friendly. 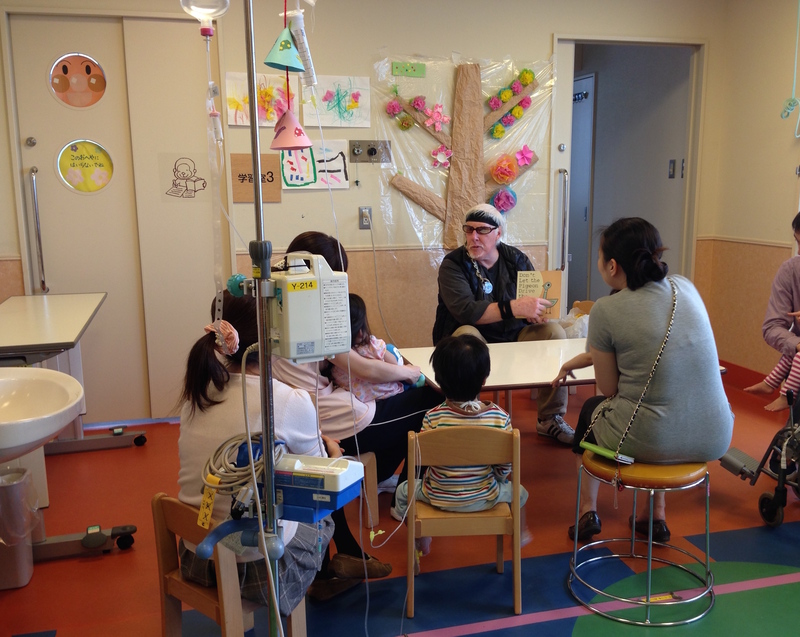 Japanese Red Cross Medical Center Pediatrics Ward & Infant Home. 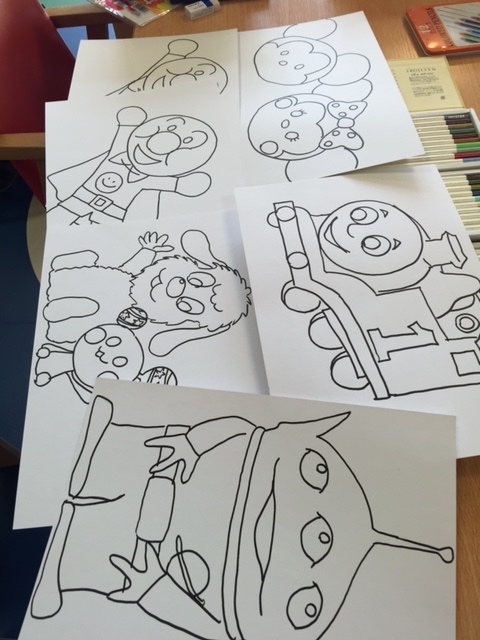 Enjoying coloring after choosing one or two among lots of Mari-san’s original drawings, doing collage of a pattern of a bird and requesting a design of Doraemon or Jibanyan, anime charactors for coloring… Creating, drawing and coloring workshop is always started by CHOOSING. 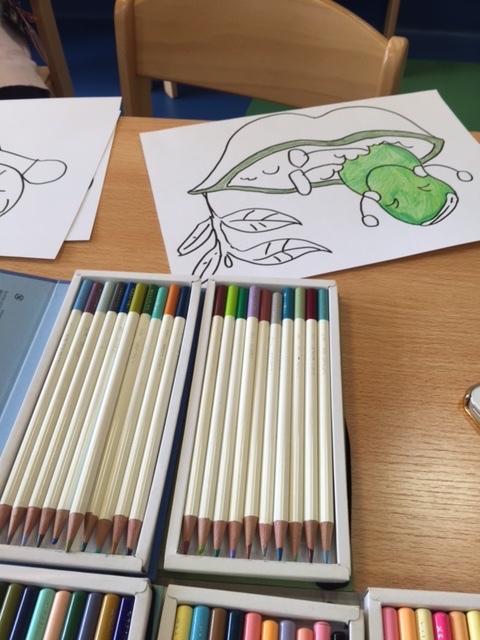 Choosing colors among a great number of color pencils is fun too! Kids enjoyed talking to each other while doing craft work using bllloons. Funny talking by Cloudy and kids’ feeding him his lines made everyone laugh. But after being made fun of, Cloudy did a fantastic magic, which impressed the whole audience and cleared his honor. Once one sees Cloudy, he/she soon gets startled. Then as soon as he starts talking, everyone can’t help smiling and no one can keep from laughing at his way of taking and comical behavior. And once in a while, he gives an English conversation lesson. Don’t worry about making mistakes but just try. When you don’t know the answer, just say “I don’t know”. That’s also a good English conversation much better than just keeping silence. 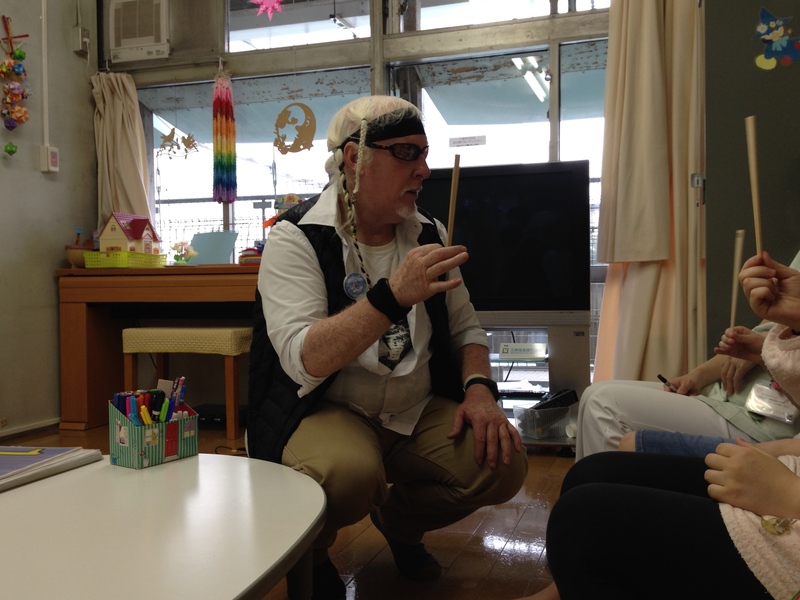 Kids’ most favorite lesson today was a magic class using chopsticks. This is homework by the next time Cloudy visits the ward. 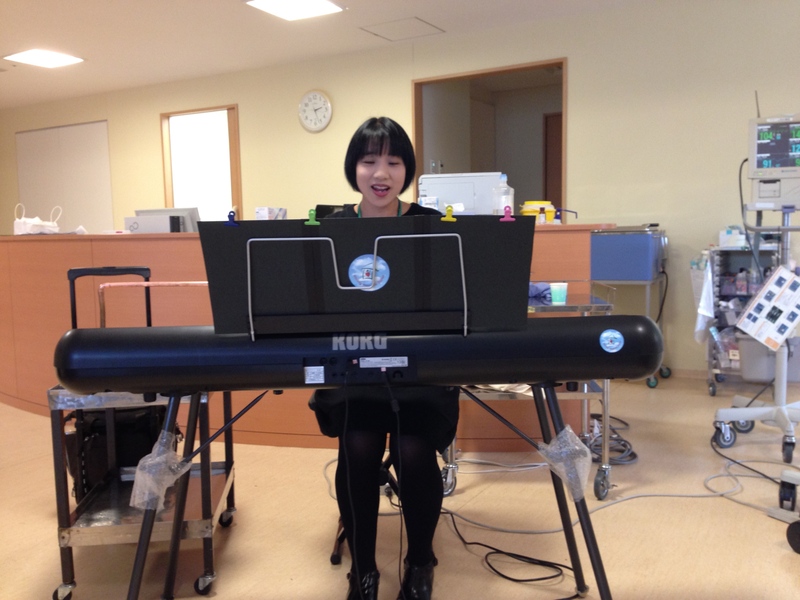 Not only enjoying piano, melody and songs but kids were full of curiosity for the player’s fingers moving, her foot tapping the pedal and those movements creating sound. Some stopped crying, some started smiling after waking up and some were burning curiosity. 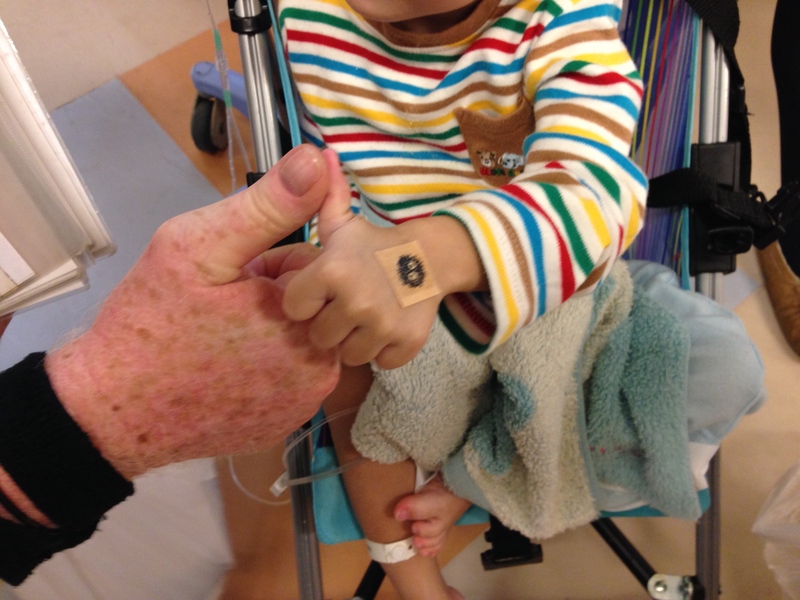 The music is such a wonderful present to those of hospitalized children. リズムに乗ってチャンツとフォニックスの楽しい英語あそび。歌や絵本、そして英語でマジック！one, two, fourじゃマジック成功しないよね。ちがうよクラウディ、one, two,threeだよ！みんなの掛け声で見事ハンカチが消えちゃった！最後はGood job touch! 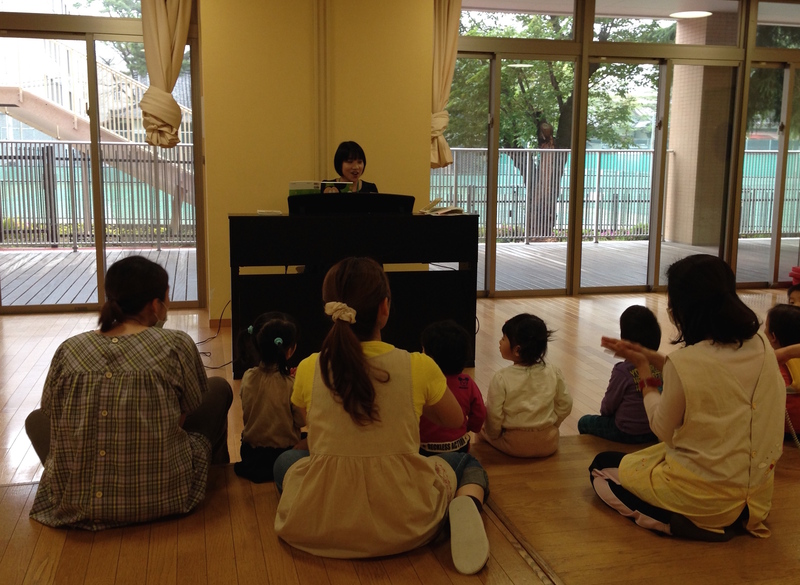 Kids enjoyed rhythm on chants,fonix and English songs. A story with wonderful pictures ” Don’t let the pigeon drive a bus!” was lots of fun. Their most favorite one was magic in English. Cloudy shouted “one, two, four!” but it wasn’t sucessful. Kids corrected his mistake like “one,two, three!”, then the magic went well and a handkerchief in Cloudy’s hand dissapeared. Everyone was happy and “good job touch!” in the end. “Let’s be a monster” workshop. 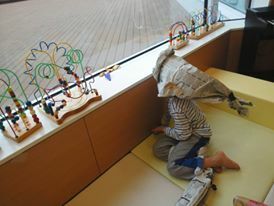 Using only newspapers and colored paper tapes, children make many kinds of things and change him/herself into his/her favorite living-things like a huge fish (image above) , a cat with a tail and a monster twice as tall as himself. They trasformed themselves into the most favorite things and visit their favorite nurses or doctors. Even they had a show in the playroom. 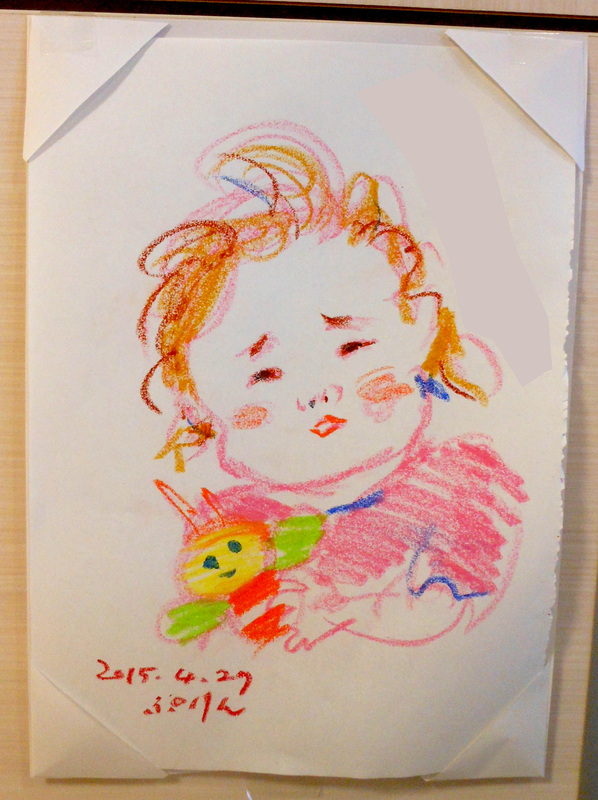 A boy made him friend in the same room a magic wand, a hair dryer with rainbow wind and biscuits, also a wine glasses to mothers. How creative and original kids’ ideas are! 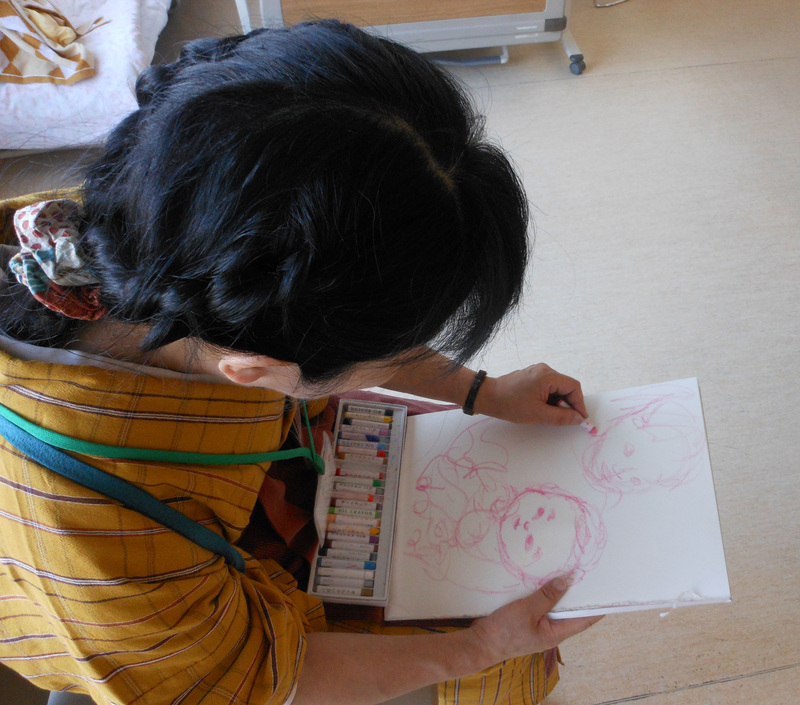 We wish the time they are absorbed in art activity let them forget about their illness and even that they are in the hosipital.